(2016) Light and Electron Microscopy Methods for Examination of Cochlear Morphology in Mouse Models of Deafness. Parker A, Chessum L, Mburu P, Sanderson J, Bowl, MR. Curr. Protoc. Mouse Biol. 6/3: 272-306. 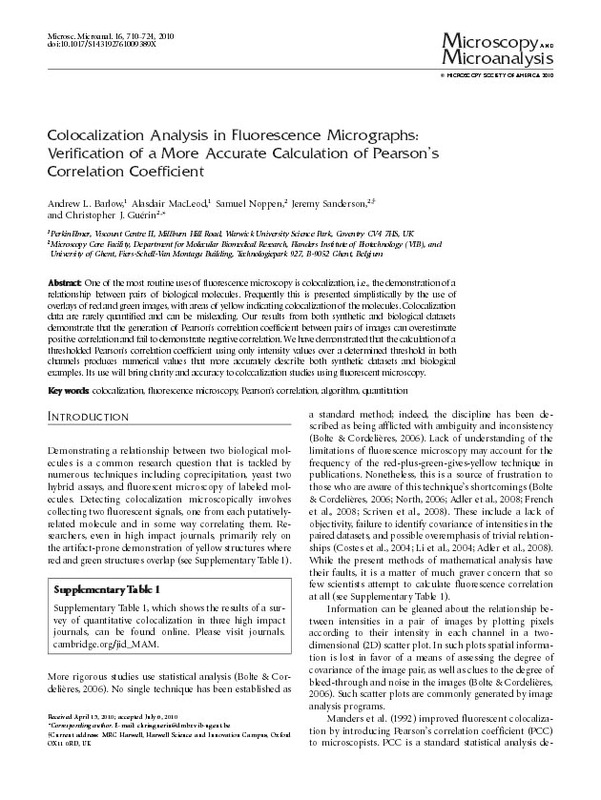 (2010) Colocalization Analysis in Fluorescence Micrographs: Verification of a More Accurate Calculation of Pearson’s Correlation Coefficient. Barlow AL, MacLeod A, Noppen S, Sanderson J and Guérin CJ. Microscopy and Microanalysis 16/6: 710-724 Link to the supporting webpage. 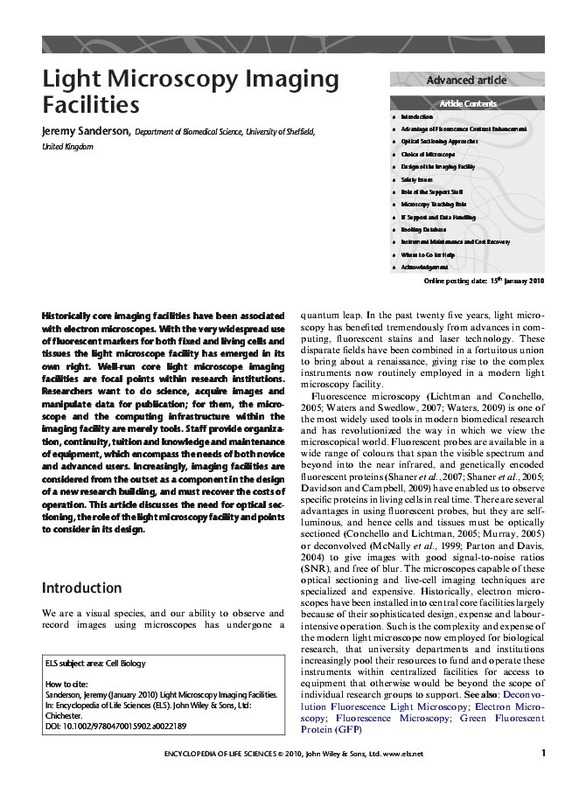 (2008) The Role of the Centralised Light Microscope Imaging Facility in Modern Biology Quekett Journal of Microscopy 40: 715-739. (2007) Design and Function of a Light Microscopy Facility Chapter 4, pp 93-113 Anderson KI, Sanderson J and Peychl J. in: Shorte, SL & Frischknecht F (eds) Imaging Cellular and Molecular Biological Functions. 450 pp. Springer-Verlag, Berlin. ISBN 978-3-540-71330-2. (2006) A new configuration of the Zeiss LSM 510 for simultaneous optical separation of green and red fluorescent protein pairs. Anderson KI, Sanderson J, Gerwig S, & Peychl J. Invited paper. Cytometry A (Spectral Imaging special issue) 69/8: pp 920-929. (2002) Practical Control of Contrast in the Microscope (II). Quekett Journal of Microscopy 39: 275-288. (2001) Invited paper: Digital imaging in pathology. Micklem, K & Sanderson, J Current Diagnostic Pathology vol 7/2: June. pp 131-140. (2000) The Theory of Contrast Control in the Microscope (I). Quekett Journal of Microscopy 38: 617-627. (1999) Phase-contrast microscopy. Encyclopaedia of Life Sciences, Macmillan Reference Ltd.
(1998) Vector Alkaline phosphate substrate blue III: one substrate for bright field histochemistry high-resolution fluorescence imaging by CLSM. Hollinshead M; Sanderson JB, Vaux DJ. The Histochemical Journal 30/8: 577-581. (1998) Contrast Enhancement Techniques for Light Microscopy. Cell Biology: A Laboratory Handbook, 2nd Edn, vol 3: pp 15-33. Academic Press. (1997) Anti-biotin antibodies offer superior organelle-specific labelling of mitochondria over avidin or streptavidin. Hollinshead, M; Sanderson, JB; Vaux, DJ. Jour. Histochem. & Cytochem. 45/8: 1053-7. (1994) Contrast in Light Microscopy: an overview. Proc. Royal Microsc. Soc. 29/4: 263-270. (1994) Biological Microtechnique, Microscopy Handbook No.28, Royal Microscopical Society Handbook Series. Bios Scientific Publishers. 240pp. ISBN 1-872748-42-2. (1993) Variation in expression of endothelial adhesion molecules in normal and transplanted kidneys: correlation with intragraft events. Fuggle SV, Sanderson JB, Gray DWR, Richardson A and Morris PJ. Transplantation 55: pp 117-123. (1990) The measurement of three light microscope test diatoms by scanning electron microscopy. Proc. Royal Microsc. Soc. 25/3: 195-203. 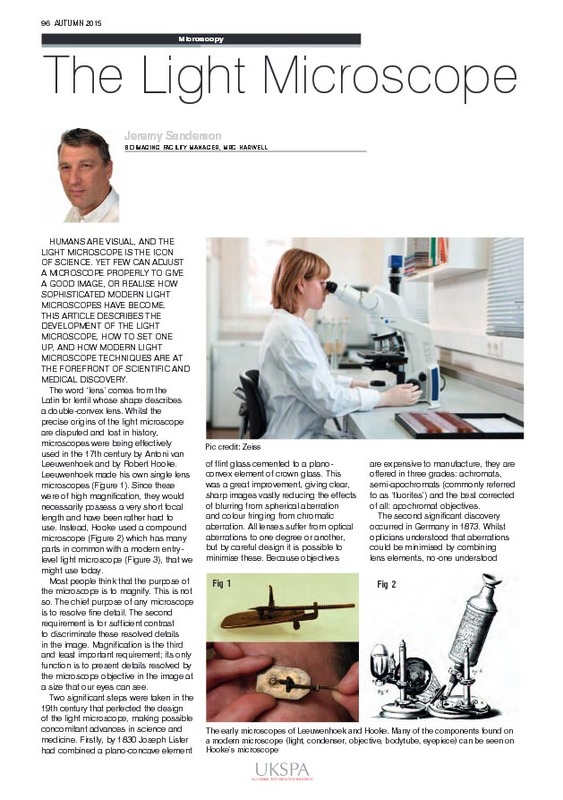 Between 1995 and 2001, at the request of my friend and mentor, Savile Bradbury, I wrote a series of twelve introductory articles about light microscopy for the Bulletin of the Quekett Microscopical Club as an introduction to the subject for the amateur microscopist. Although a little dated, these may be found here as PDFs. Additionally, whilst teaching the principles of contrast enhancement I wrote a contrast bibliography of various references. I hope that you find these articles useful. I wrote them whilst teaching for the Royal Microscopical Society; from which Understanding Light Microscopy ultimately came to be written.